Ask around the Interweb which is the "Wurst model evahh", and the chances are you'll find no agreement. Apart from whatever the latest thing produced by any particular manufacturer by those who prefer their boxes a different colour. 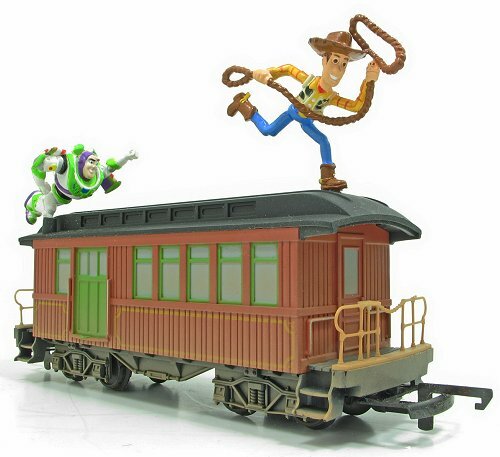 One contender that often comes up among the less partisan members of the community, is Hornby's Toy Story train set. Produced as a film tie-in, the things didn't appear to sell very well judging by the numbers appearing on eBay at £19.99. At the time, I nearly bought one. It would fit in nicely with my collection of Triang odd-balls and seemed suitably silly. I didn't, but now I wonder if I really should have. You see, I managed to buy the coach from the set for a fiver and it's an interesting piece. If I'd been asked to design this set, I'd have looked at existing mouldings. There were some perfect wild-west models in the Triang range. Presumably, the moulds weren't available, so they had to tool up from scratch, and on the cheap too. On the plus side, the decoration isn't bad and it looks OK in a toy-like way. The windows are blind, but the colour is quite subtle so you don't immediately notice. Woody and Buzz on the roof are well designed and look like the film characters. I don't recall a train chase scene in the film, but I'm sure someone will correct me if I'm wrong. Underneath is where things get interesting. The apparently bogie stock is fixed after all. Massive side play for the axles and a short wheelbase ensure it will get around the oval of track supplied in the set. Kids won't be bothered and assuming it all works, then that's quite a cost saving over all those bits required for proper bogies. Is this clever? I'd say so. You don't do a film tie-in set for rivet counters, you do it to make pots of cash. Keep the costs low and don't worry about the quality too much. Ir the kids do get hooked, at least the models are fitted with proper tension-lock couplings so the set can be expanded. I'll be keeping an eye out for the rest of the set I think. R2D2 building continues with one of his legs. Looking at the model before all the casing goes on, it looks pretty impressive. The weight is certainly satisfying. To fit the part-work ethos, there's quite a lot of cast plates bolted together for the main supports. The wheel also has to be assembled and runs in rather nice chunky bearings. No assembly is required for the motor/gearbox which I could find uses for in other models. On the back of the motor is a magnetic sensor which presumably allows the internal computer to work out how far the little droid has moved. Everything has gone together with the exception of one of the motor plates in the foot where some homes needed to be opened out to accept the screws. I'm assuming that the right screws were used but there are quite a lot and it's not always that obvious. DeAgostini have sent spares after a request so we aren't worrying too much as long as the thing goes together. Hint: Make sure there is a bit of slack in the wires above the motor. The casing is quite tight here and the screws had to be slackened off to allow the wire to be pulled down a bit. 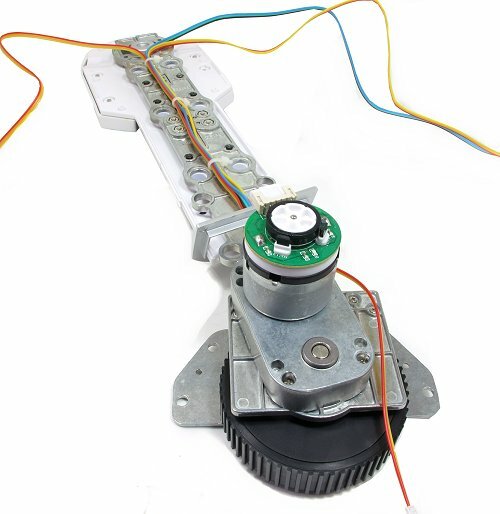 A test cable allows the motor to be run, and with that gearbox, it's a torquey little beast. I couldn't grip the wheel tight enough to stall it, even on 4 volts! Filmed a couple of years ago, here is a taster of the short of layouts I should be seeing in Canada. 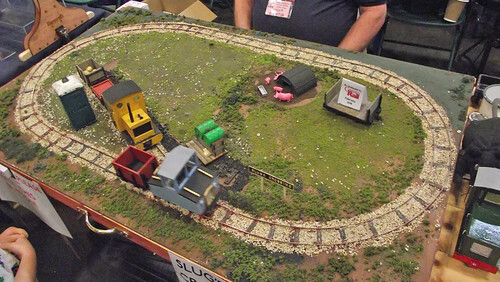 Not that different from most UK shows, but they can't nip down to the local model shop and pick up the bits for a layout quite so easily as we can. All being well, tomorrow I'll be taking part in this show. I say this, because the journey will be a bit longer than normal - 3700 miles to be precise. All the way to Canada. 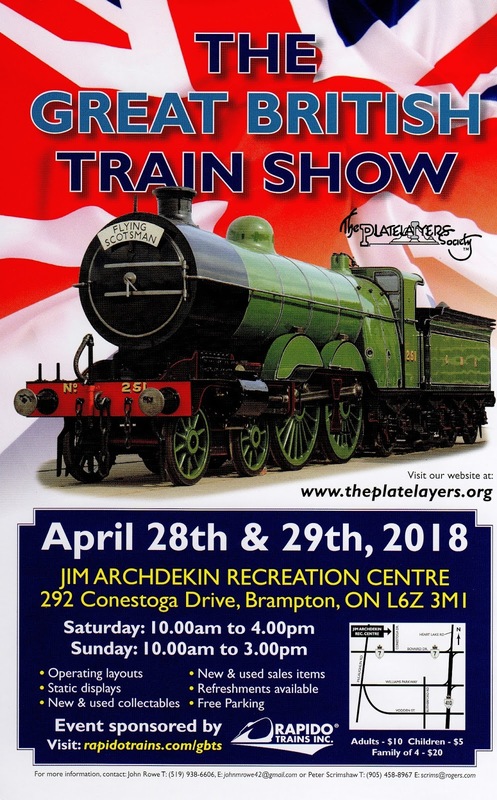 Some of you may remember a challenge issued by Rapido Trains for someone (me) at BRM to build a layout to take to the show. 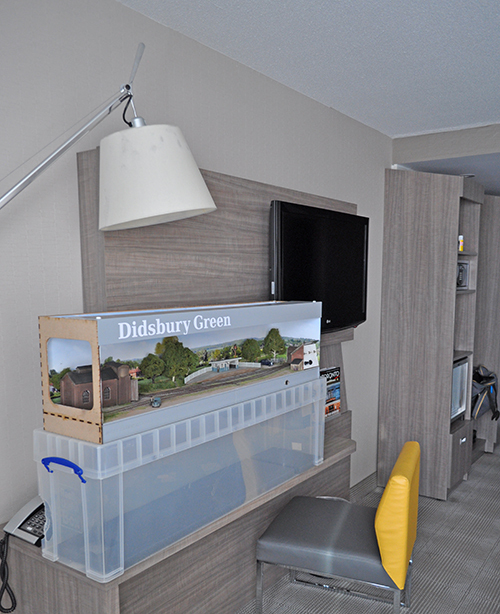 Since the model has to travel by 'plane, Didsbury Green was born. A layout that fits in a box makes a lot of sense - I hope! Packed carefully, the model was entrusted to Canada Airways. 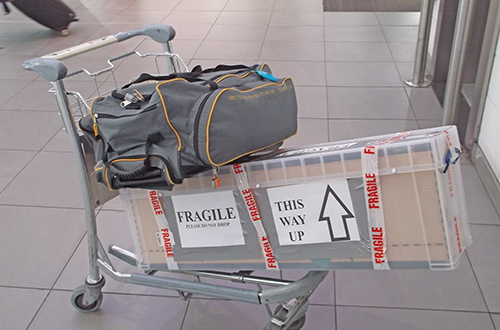 On the 'phone they had said that a well-labelled box should be OK in transit in the hold. 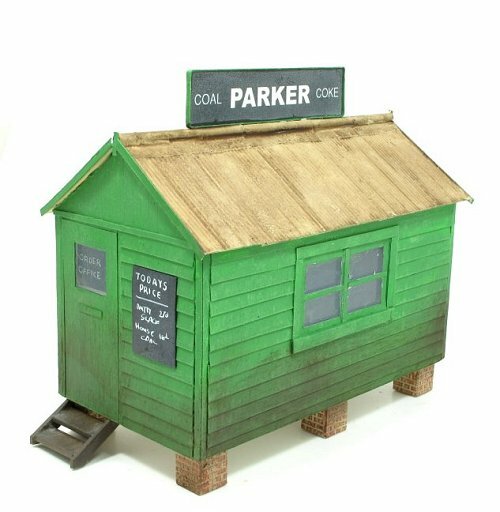 My suggestion to the press office that we should have it in the cabin for "the world's highest altitude model railway show" being ignored. Sadly, things went awry. 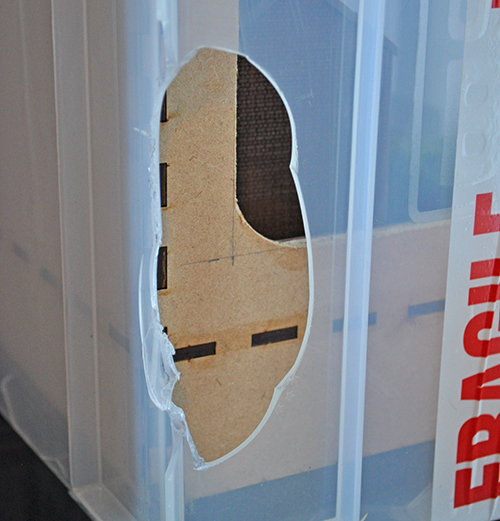 Something punched a hole in the strong, plastic box. Whatever it was, knocked the engine shed off and snapped the plastic pole in fixing the water crane in position. Luckily, pretty much all survived in one piece, so a few buys from the dollar store and a lucky find of Woodland Scenics trees and flock in a craft store have allowed me to fix everything. I've even had a loco running! If you think model railways are too expensive, the solution may be to look back in history. That's what I'm doing this month in BRM, building a coal office using techniques and materials that date from the 1960s. The design is from a Skinley drawings, which the HMRS have allowed us to reproduce for readers to copy. Why did I pick this model? Well, as you'll see on the DVD, we visited the plans room to look at some historic modelling and I was taken by this one as a project. There's a lot more to see though, and if you enjoyed our vintage issue, you'll love some of the material we uncover. I have the opportunity to drive to the East of England Showground at least twice a year, and every time I pass this building, I think, "That's odd, there is a railway station totem on the side. I wonder if it is a real railway station?" A few weeks ago, I remembered to find somewhere to stop and bag a photo to remind me to do some research. 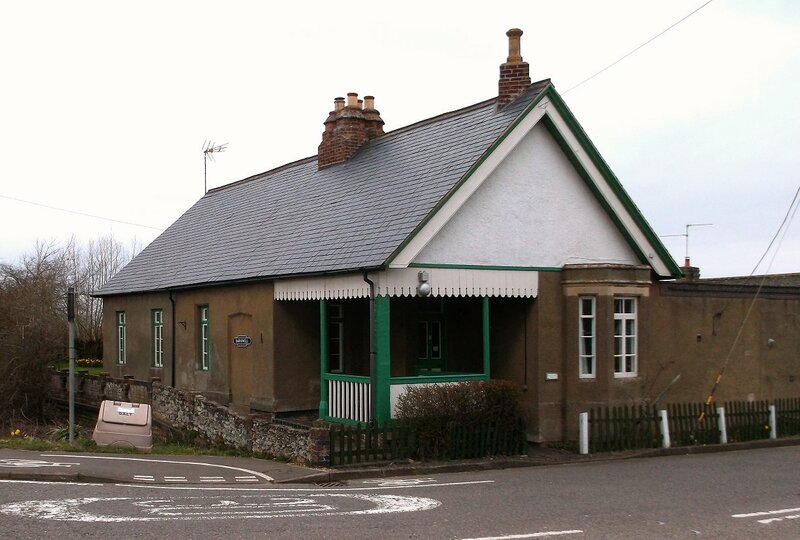 The answer to the "Is it a station?" question is - Yes. To be honest, I can't do better than suggest you follow this link for the historical stuff. Nice design feature alert - the completed walls slot into the underside of the roof. A ridge provides nice positive location. You can't go wrong, and there is plenty of contact between plastic bits for the glue to do its job. Unfortunately, as you can see, once dry the walls are still a bit wobbly. The model doesn't sit flat on the board. Bending with my fingers helped a bit, but more work was required. I had always meant to add some internal walls since looking through a building just isn't right. While not planning on fitting a detailed interior, I had pondered on cutting an archway in the main wall - a popular feature and one you'd be able to see from outside. On balance, I'm sticking with solid walls from a nice thick plastic sheet off cut. 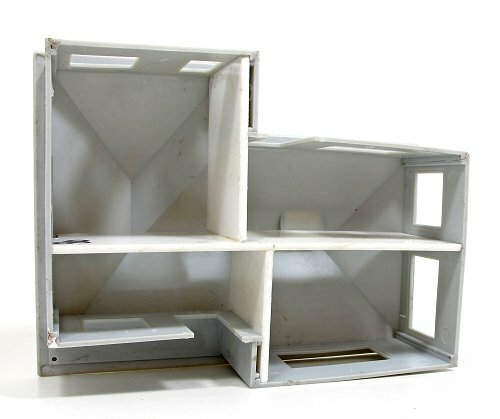 A bit of careful measuring means they push the exterior walls out a bit at the bottom so everything is sort of square and the model sits on ground as it should. I don't plan to build the bungalow straight from the packet. There's no fun in that. First improvement involves the guttering. While the bottom of the channels is modelled, the top is flat and since it's the but you see, looks odd. No problem. Run the Olfa cutter along the middle with the aid of a small steel rule. Then open up the channel using a round needle file. It's not really filing, more gouging out a curved channel. There's probably a "proper" tool for the job but I don't have it and this works fine, which is all that matters. A little smoothing with some sanding needles and it looks a lot better. 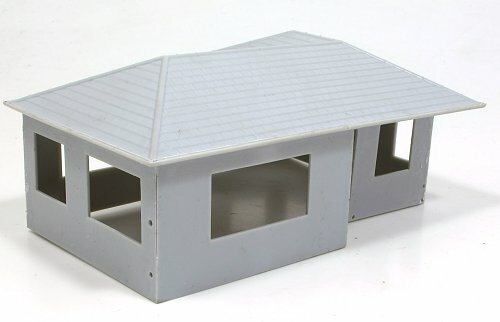 Not sure why Airfix didn't do this themselves as the rest of the roof moulding is really rather nice and detailed. 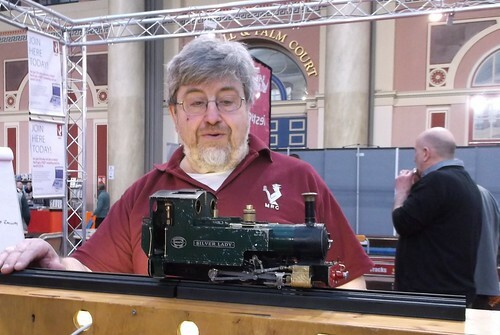 I can't be taking out a model railway with locomotives straight from the box can I? The P Class has been treated to a light dusting of Humbrol weathering powders. Nothing heavy, the new owner might not want a really filthy loco after all. Basically dark brown brushed everywhere, rust on the smokebox and smoke over the boiler top and cab back. No fixatives are used, the powders are usually sticky enough as long as the model isn't handled too much. Again, the new owner could look at cleaning them off if they prefer. To my eyes, even a light weathering has improved the model a huge amount. Pride of Sussex always looked, in the photos I've seen, a bit careworn. Never really ratty, but a working loco with all the dirt this entails. The crew is from Monty's Models. I know a ModelU "proper" crew is available, but not when I needed them and anyway, everyone will have those and I like to be different. Poking the figures in through the cab sides was "interesting" though. Care required to keep superglue from the painted bits. I had a dry-run with the driver and was glad I did. I've never had any interest in visiting Ireland, apart from one thing. I'd like to see the Listowel monorail reconstruction. For the minute, I'll make do with this video showing a run along the line. Operated by a diesel-powered replica locomotive, it's certainly quite something. My understanding is that the weird looking system was much easier to lay over uneven ground than conventional tracks. It would have to be, in all other respects, it's a right pain! Looking through the April 1978 issue of Model Boats magazine, I was shocked to trip over this advert. 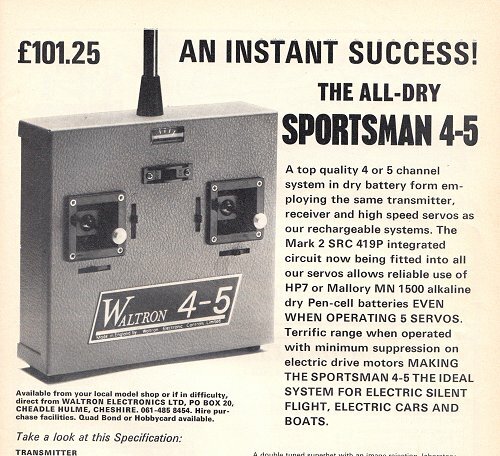 £101.25 for a radio outfit would be considered strong money today. A quick look at Cornwall Model Boats shows a Hi-Tec5 channel system for £84. That's neither the cheapest set or the cheapest supplier. You get 2.4mHz for that too. Even a 2 channel setup from Sanwa on the previous page comes in at £54.95 with 2 servos or £39 with 1. At the time, the average house price was £13,820 - 136 RC sets. Now it's £211,756 or 2520 RC sets. In 1978, milk was 11p a pint so 921 pint for the RC (now 88p or 95 pints for the RC). Technology moves on and really does get cheaper. The "good old days" weren't always so good after all! With G Rail on the horizon, I've done my best to find plenty of G gauge modelling to sit alongside the show preview. We've an extensive, and well established, outdoor layout for a start. Then moving indoors there is a micro model railway. Finally, as for many people G scale means LGB, we look at some repairs to an LGB loco - and cover LGB's 50th birthday models. 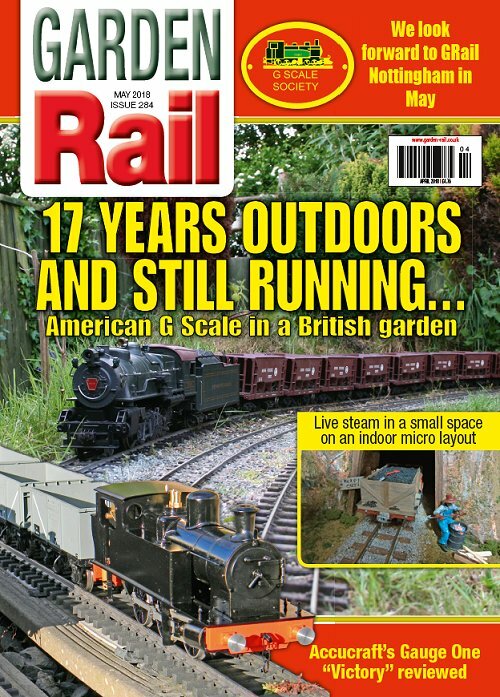 That's not say other scale are ignored as Tag meddles with his Mamod diesel, Matt builds a brake van, we look at a 16mm vertical boiler loco and the new tank from Accucraft. Garden Rail's letter page makes a re-appearance with lots of chat even at this early stage. And I fit a chuff pipe into my Ragleth. This house isn't very far from where I live and every time I pass it, which is quite often as it's on the bus route into town, I think "That looks like something out of a Beal or Ahern book." While photographing a building from the pavement is legal, it does look a bit odd to the owners. However, since the property is currently for sale and empty, I thought it a good time to bag a shot. 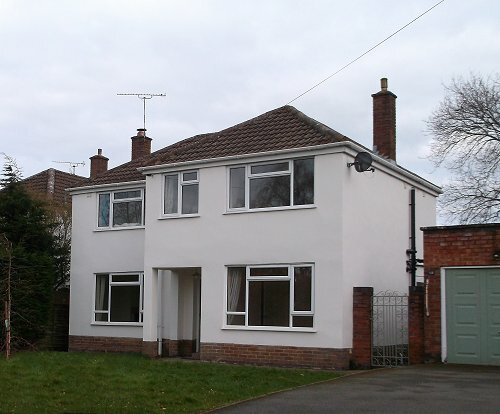 Pretty much a classic suburban villa, the house hasn't seen much in the way of alteration. OK, the windows would probably have been steel framed in the past, but the double glazing isn't unsympathetic. Annoyingly, I can't find much close from either of the authors mentioned, but I'm sure this could easily be a Bilteezi kit. Those ex-Airfix walls go together nice an quickly. Despite the age of the mouldings, there is very little flash and part fit is generally pretty good. The nearest corner is the worst and yet a touch of filler will hide the join. Soft plastic means wobbly and slightly twisted components. A teak with fingers is mostly enough to fix any problems and I'm sure as the kit comes together, it will be strengthened by the roof. I'm tempted to add internal walls too. Handy hint. Pay attention and make sure to identify the right bits. Or at least be ready to peel things apart if you get it wrong. 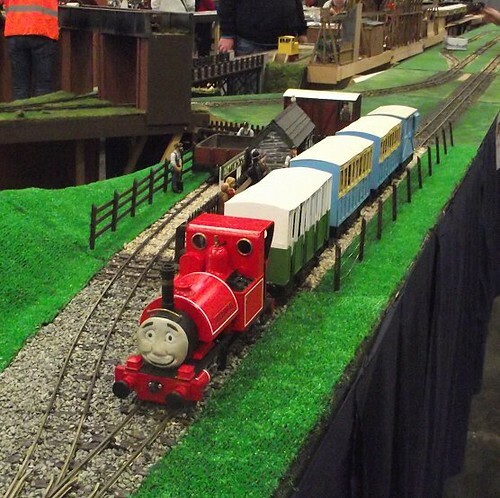 There I was, standing behind my layout at Ally Pally. A father and son arrive in front and start to chat. The youngster has a few questions, and when I look down to answer, I notice he's holding a plastic bungalow. Over in the children's area, da kidz are being tutored on assembling simple Dapol plastic kits provided by Eileen's Emporium. Talking to the team running the stand, it was very popular and all kits from the range are in short supply as people decided to take one home to have another go. How so I know this? Well, looking at the rather well made model, it occurred to me that this is a kit I've never built. Right then though, I decided to rectify this omission. It just took a bit of a search to find one. 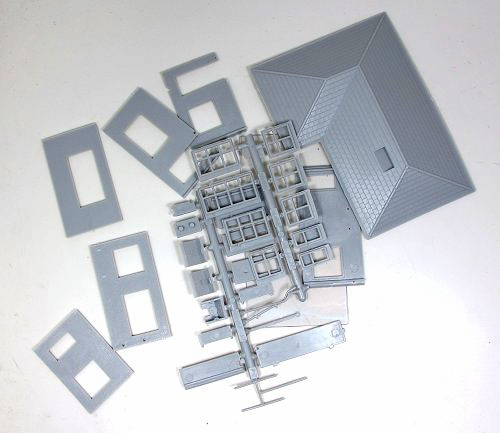 Most of us are familiar with the ex-Airfix range now manufactured in Wales by Dapol. The plastic is now very soft, presumably to save the moulds which are somewhat older than I am. Despite the age and material, the detail is sharp enough and for just over a fiver, a good looking building is promised. 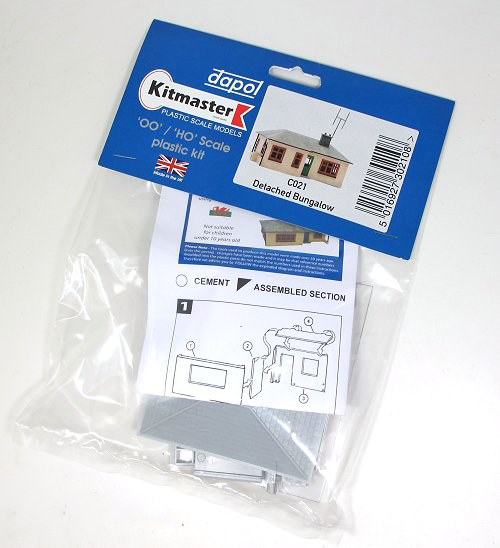 Incidentally, although the card header displays the Kitmaster logo, this was introduced in 1957 by Airfix and doesn't ever seem to have been part of the Rosebud product line. Another busy event for me. So busy in fact, that I didn't really have time to shoot some blog photos - too many magazine pictures to bag. Fortunately, my parents were happy to oblige, some of which are in the album linked below. These breathtaking grounded van scratch built in G3 (1:22.5) scale. There's little that needs to be said about this amazing modelmaking. Super Nellie! 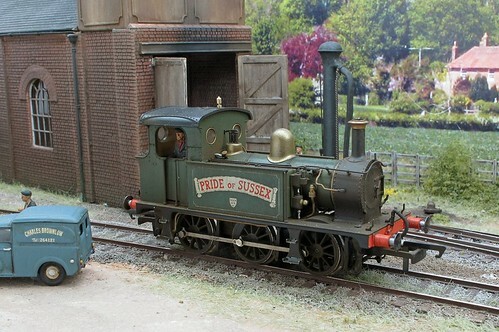 A giant Emett model running on a Bachmann G gauge "Percy" chassis. 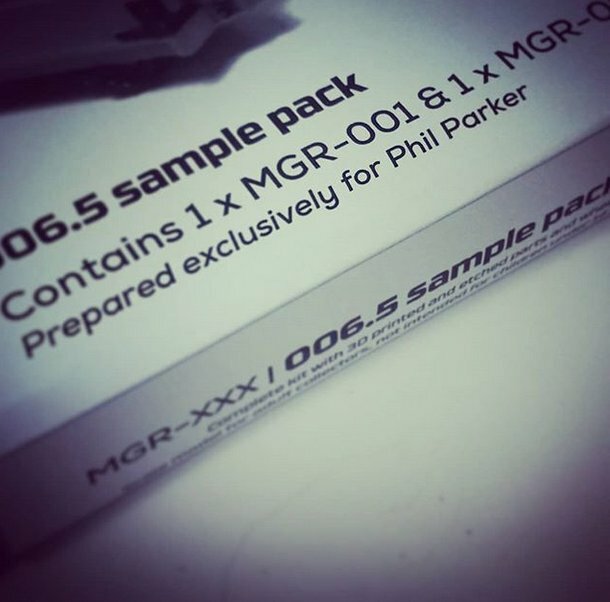 Kit from Smallbrook studios. It would cost the same as a cheap steam engine, but it's mahoosive! And in other news, I need a hat. 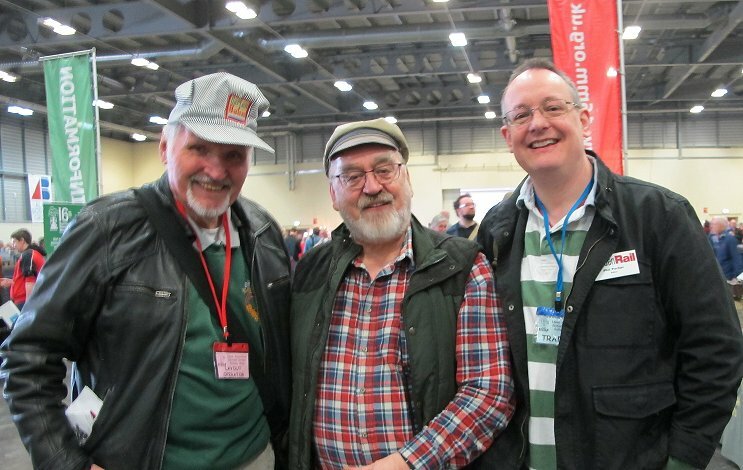 Here I am with Manfred R. Meliset, editor of Garten Bahn magazine, and Tag Gorton, once of Garden Rail. They both have hats, should I? Reading Ben Jones excellent X-Trains bookazine, I was fascinated by Willam Brunton's entry in the Rainhill trails - the Steam Horse. Locomotive design being a long way from standardised, he decided to solve the problem of providing traction by powering the machine with a pair of walking legs at the back.This seemed crazy now, but at the time, everyone was working with a blank sheet of paper, probably without the benefit of actually seeing another working locomotive. Brunton just took his cue from nature. We'll never see anything quite like this again, I thought. But no. A couple of days later, this video appeared to me on YouTube. I don't know a whole lot about it, other than the mechanical action is fascinating. You need to be careful on the Internet. This week, my Isle of Man Steam railway mug was involved in a catastrophic washing up incident. It's a lovely mug, I bought one after enjoying a cuppa while chatting to Colin at Union Mills Models, he served the drink up in one and since I enjoyed our meeting so much, I felt that an identical drinking vessel would be a suitable souvenir. 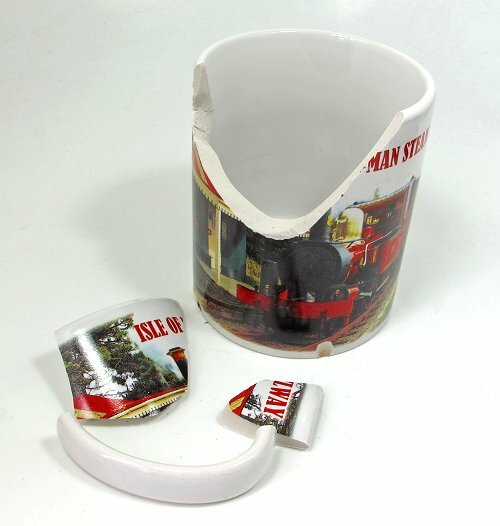 Anyway, I was a bit sad about breaking my mug and posted on Facebook, "My Isle of Man steam railway mug has broken. :-(". At least that's what I meant to post. Thanks to the joys of autocorrect and a tablet computer now struggling to deal with the heavy page load the Facebook website has become, I actually posted, "My Isle of Man steam railway has broken. :-("
A few minutes later, the editor of Narrow Gauge World is in touch asking what's up. I hadn't realised my mistake and for a while wondered why he was so interested. It turns out that the post had fired up his journalistic juices and suggested yet another problem had befallen the system. I quickly assured him that as far as I know, only my mug has an issue at the moment! Anyway, I have a trip back to the island booked for later this year and I'm taking a car. A supply of mugs will be purchased - tea tastes so good out of them! 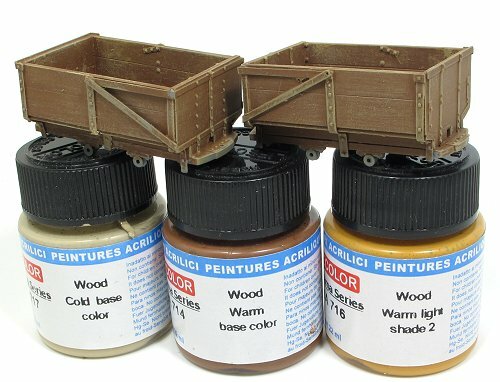 I like to describe my weathering methods as 70% of the results for 30% of the effort. 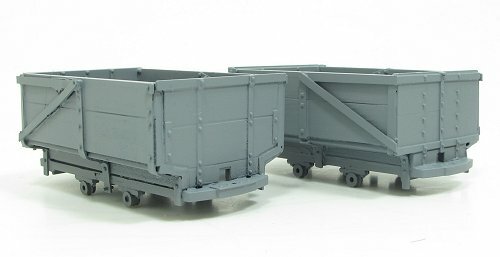 There are many people, especially in the plastic kit modelling world, who do a better job. The effort required for their models is tremendous and most of the time, I can't be bothered. Let's face it, even the idea of spraying everything puts me off. Anyway, the tubs are done and (I think) look OK. After the woodwork was painted, all the metal had a coat of Humbrol dirty black acrylic, which weirdly gummed up a nearly new brush destroying it. Then some washes of black and brown Citadel weathering washes. Finally, loads of powder. Inside, there was a shot of hairspray first to ensure a really good, claggy buildup of "coal". The finishing touch was rubbing a normal HB pencil in the wheel treads, which looks rather effective. Another ugly bit of Alexandra Palace. Standing in the exhibitor's cafe, I spotted this cracking emergency generator. Basically, a box topped with an exhaust, it would be a doddle to model. Lots of places have these power backup devices nowadays, so you could tuck one into many locations. When I worked for the council, we had two, right in the centre of town. 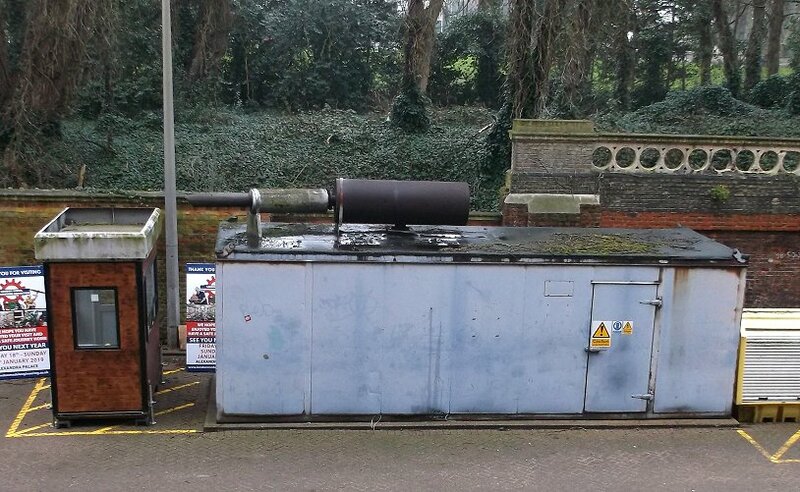 Sadly, the contractors employed to replace the power units one weekend didn't do a great job and the ground became sodden with diesel fuel. Looking at the Grandt Line website, I really didn't like the yellow finish they show on the model. I know these things live in mines, but I associate yellow painted tubs with more modern metal versions. I thing dirty wood is the way to go. My plan was to use the Lifecolor wood set, but when I tried the paint on the plastic, it didn't stick. Colour (should that be "color") pooled up as though I was painting on grease. I don't think it was mould release, just a shiny plastic and not very sticky paint. The solution is of course, a spray of car primer. Grey seemed to be the best colour for worn wood and application went well, even though I didn't shake the can for 5 minutes, because I am a rebel. After this there was no problem with paint. A couple of coats of Warm base colour followed by dry brushing with Warm light shade 2 and a bit of Cool base colour. Working quickly, the colours all blend a little to give a nice result. Not bleached, these things would surely not see enough sunlight, but brown enough that when they get filthy in the next step, the result will look OK.
Perhaps the biggest surprise at York came when I collected a couple of kits for review Stephen at Narrow Planet. Not only where they as well packaged as ever, the box label says they are for me! Needless to say, this flattery will not affect any comments I make in the review. I've written up a few of the firms products in the past and don't expect there will be much to worry about, and the post-purchase backup is really good too. OO6.5 (4mm scale running on 6.5mm track made popular by the Busch Feldbahn system) is pretty niche, but then narrow gauge is popular these days as ready-to-run models locos appear on the scene. Chatting about the business, Narrow Planet are providing a useful service to tiny manufacturers by providing the on-line shop they all need, but frequently don't have the resources to run themselves. For customers, it becomes a one-stop-shop for the slightly oddball products which can make them aware of all the other goodies available in the scale. Fun, but potentially expensive! York came with a list. A list of people I really needed to talk to. And it was quite a long list. Fortunately, talking is something I enjoy doing at shows. If I'm honest, it's the main reason I go. So, starting in the tea room, my Dad and I identified the target stands and headed out. Being quite a traditional show. York has very varied trade and there was certainly lots to look at. Our first purchase, on the first stand we saw, was a model boat kit. Well, I've got enough toy trains after all! Working our way down the hall, we managed the second mezzanine before lunch called. Even refreshments called for a chat with the organiser of the Ally Pally show. By the time the ground floor was reached, we were tired but doing well. 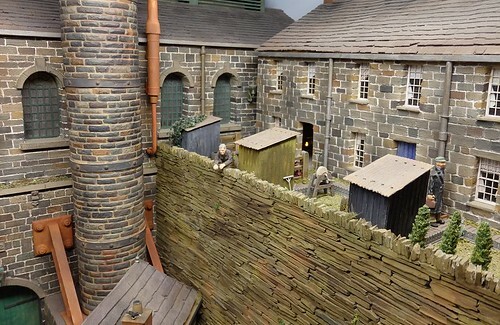 For both of us, the favourite layout was Canalside Ironworks by David Atkinson. 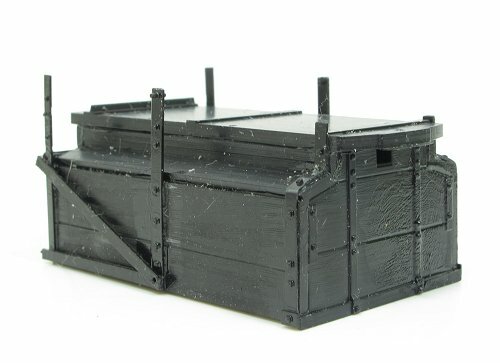 Nicely small, full of big building and grimly industrial, it was full of detail and is just the sort of model we'd like to be building at the moment. 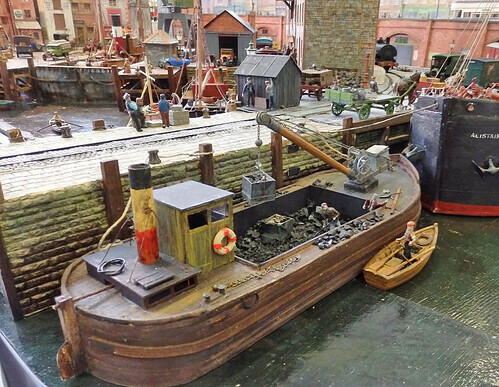 I like the miniature version of the infamous "loco on a boat" scene from The Biggest Little Railway In The World, this time filmed in Crinan locks it seems. Mind you, since the layout featured a completely fictitious, but well done, railway station, we can't complain about that! 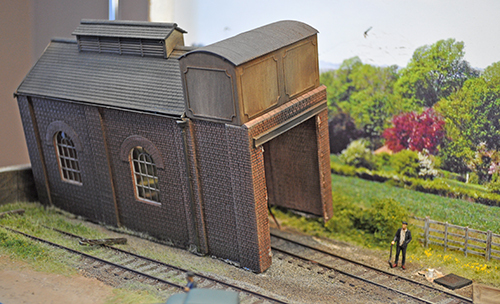 Another first was the convincing thunderstorm on Z gauge layout "Bullet Trains of Japan". No rain, but the light and sound effects worked a treat. Those exhibiting put on a terrific show. We left at chucking out time and could have done more. The list was complete and I was so tired, a stop on the motorway for a pick-me-up coffee was required. Good show.It's hard work though this exhibition visiting! With my garden railway hat on, I've been looking at Faller E-Train models from the early 1980s. This system used models large enough for Playmobil figures, just like the later LGB based official system, but on 32mm track. I remember the railbus being converted to a "proper" model in an old Railway Modeller magazine, but had largely forgotten about the system apart from that. There are some nice models, the coaches being particularly appealing. Much watching of eBay will ensue! Anyway, this weeks video shows a garden railway built and operated using Faller e-train parts. OK, these are toys, but the low-level viewpoint give an air of realism to the scene that isn't always present with garden railways. 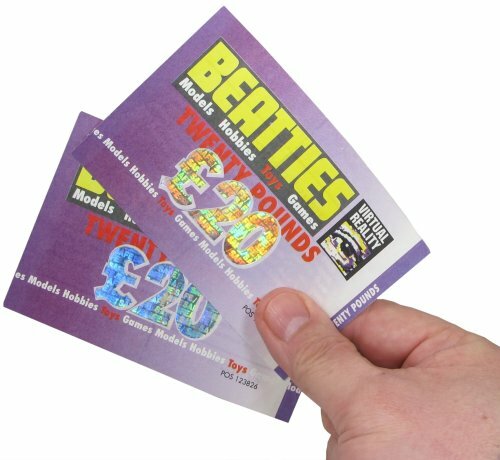 A bit of a find on eBay - 40 quids worth of Beatties vouchers. All for only £2! These are pretty sophisticated with holograms and embossed paper. No numpty was going to be able to forge these and buy a Rough Rider kit with them. You'll be pleased to know that in the spirit of investigative journalism, I have asked if ex-Beatties members of staff now risen to prominent positions in the model railway world would be willing to accept them in part payment. The Grandt Line tubs are made from interesting plastic*. Most of the body is a really hard, even slightly brittle material but the strapping is much softer. This is important because it has to be bent around the overhang at the bottom of the body. A wash of plastic solvent seems to help with this as I only broke a couple of lengths prodding around with a screwdriver. Working out where everything goes is awkward as there aren't any instructions and the photo on the website isn't that clear. I think I've got it about right but if not, I'll just have to not care. *Yes, I know how nerdy this sounds, but the properties of different materials really interest me. 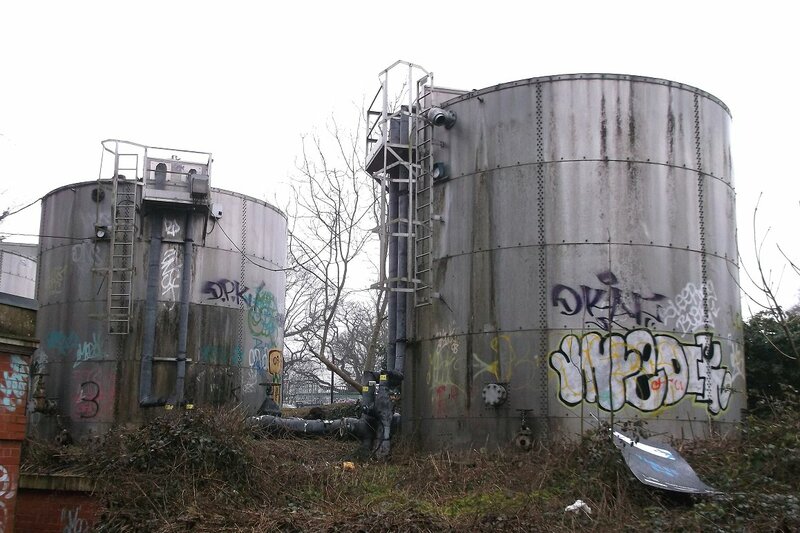 Spotted behind Alexandra Palace, the best guess anyone can make for the purpose of these really ugly storage tanks is that they are something to do with the ice rink. They are properly hideous, but so modelable at the same time. 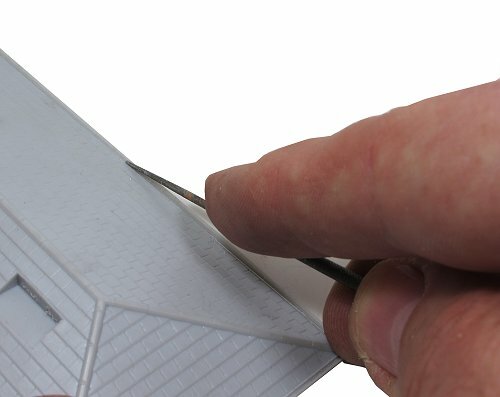 Strips of plastic around a plastic tube for the main construction and ladders from a plastic kit would do. Paint grey and then lots of green staining. Finish with some graffiti and bed well into the embankment. 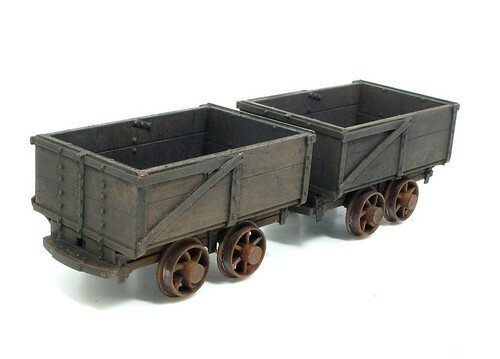 Bought at Lancing show for no better reason than they are interesting and cheap - a pair of On3 mine tubs are sitting on my workbench. 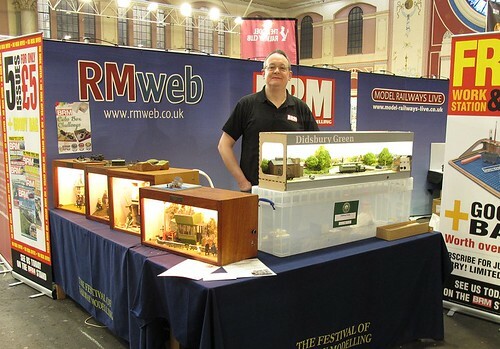 If you've not heard of On3 before - 7mm scale modelling 3ft gauge prototypes. The track should be 21mm apart and for no reason other than they haven't grown up enough to use metric units, our American cousins prefer to describe this as 1/4" scale. The ‘E’ vans were four-wheeled brake and luggage vans fitted with lookout duckets, but otherwise entirely sealed with only two drop-sash windows at the guard’s door. None of these vans survive today, and they were effectively made redundant when later passenger coaches had their own braking systems. The primary purpose of the ‘E’ van was to provide luggage accommodation and braking for the original ‘A’ – ‘D’ class most of which did not have their own brakes when supplied in 1873/4. One surviving member of the class sat at the end of the Port Erin arrival platform at Douglas for many years and retained its pre-war two-tone brown livery. The Manx Northern Railway owned a pair of similar vans for use with the ‘N’ class carriages, but these seem to have been replaced in the 1890s and then used for goods traffic until they were scrapped in the 1920. The latest Isle of Man model from Accucraft was always going to be an essential purchase for me. Just right to coupling on the back of a short set of 4-wheel coaches. Unsurprisingly, the model matches these perfectly. It's very nicely made in plastic with high-quality paint decoration. The model shown is straight from the box. I haven't fitted the supplied number transfers or lamp tops. 45mm gauge wheels are fitted, but as usual, 32mm versions are included. I'd be interested to see a van fitted with these as it must look a bit top-heavy, but each to his own. 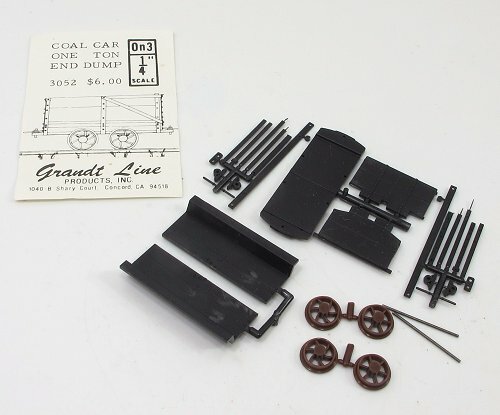 In G scale, this represents 3-foot track, so I assume 32mm is sort of 2 foot. Those lamps would benefit from LEDs inside, but the roof comes off to allow this. 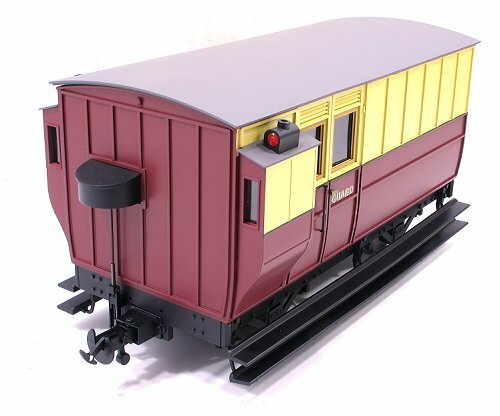 Keen types will fit interior detail too - Brandbright make wooden kits for the coaches and may well do one for this. 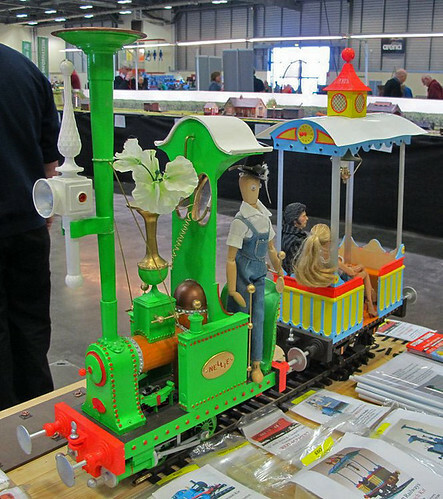 A popular model, this was number 19 sold from a stand at the Large Scale Show, and they weren't the only supplier with the model. Full specification on the Accucraft website. I've got a nice corner of the BRM stand, just inside the door. On show, we have Didsbury Green, four Dave Rowe Emmet style dioramas (loaned by Green Scene) and a selection of Cake Box projects. It's a good job I was happy there, because the show was so busy. On Saturday, the only place I ventured while the event was open was the stand selling sausage rolls 50 feet away. Then I scooted back to the stand to carry on chatting. Lots of people were interested in the layout. 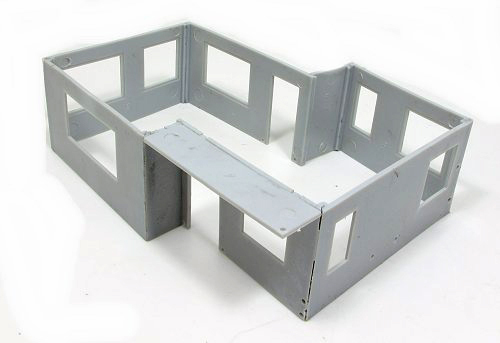 Many wanted to know about the baseboards (ModelRailwayScenery) and the box the thing fits in for transit (Really Good Box Co.). The station building (Hornby) and engine shed (Wills craftsman kit) also generated lots of discussions as neither is straight from the box. Quite a lot of people talked DVD too and generally, they seemed to like it. Apart from one bloke who came up and announced, "I like the DVD but the latest one was crap!" - which I think was meant as banter. He went away happy after a few minutes anyway. Three people even wanted to take my photo - but I wasn't the most famous thing there. This wasn't the only brush with telly either. Channel 5 has commissioned a new challenge series and I interviewed producer Pat Doyle. You can watch this on YouTube. Sunday was quieter as expected, but I was still kept busy all morning. After the sausage roll run (with crisps - get me living the high life!) I did manage to stroll around to have a quick look at some layouts and traders. This was a flying trip around though. Chatting with the team running the children's area after seeing one of their "customers" early in the day, did set me off on a bit of a buying mission. We'll come back to that in the future. I was very tempted by possibly the maddest model railway item I've ever seen - a Marklin Tip-Kick set. Basically, a van with a couple of holes in the side, strange shape football and large footballer whose head you push so he kicks the ball. I assume the game is to get the ball in the van as it travels past on the layout. Is this why Germans are so good at penalties? Anyway, a very busy weekend. The show looked good and people seemed to be enjoying it. Sorry there are not more photos, what I have you can find on Flickr.